Search Autocomplete helps customers to save time searching for desired product, find results significantly faster, and check suggested by Ajax search algorithm products, that customer might be looking for. Improve search results with new AJAX search suggestions algorithm. Search by all product attributes, tags and catalogs. Show product search suggestions with thumbnails, price, rating and short description. We know that the standard Magento search system is not flawless. As well as that, we are aware that it is crucial for your customers to hit that magic button and find exactly the products they've been looking for. This handy search autocomplete extension is an important component of the website that is not to be ignored. Well-refined search results can drastically improve your Magento store by lowering bounce rates due to inaccurate results and increasing conversions and sales. Keeping these aspects of your success in mind, we are proud to present our Magento Ajax Search Autocomplete and Suggest module. Being easy to configure, this module will narrow down lookup suggestions for your customers. It is a perfect combination of rich settings and convenience in use. Is the best extension for live search. I tried another 2-3 extensions but this is by far the best for all what it offers. Nice team and support, really satisfied. Support Team, thank you for providing a very good support service. It helped me a lot in making the final decision.I would like to emphasize that Ajax technology is really convenient for customers. We received some emails from our customers pointing to our store visible improvements. It is perfect for my site. 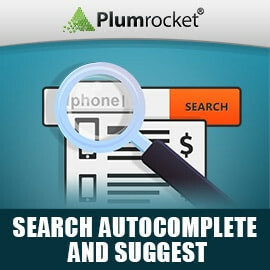 Few days ago I found lot of solution for advance search but I have choose plumrocket and it was best choice for me. My customers now feel much better comfort than before to find any product easily. Thanks for the support. This is my go to search enhancement extension for M1 - it retrurns better search results than the stock Magento search with the added benefit of categories and cms pages returns in the search suggest box. Got this search extension & installed it on my own, though there were some minor issues in the initial installation. My developer resolved it & now its working fine. Really love it. This is a very good extension to have and the price is good. Works well . It is definitely a plus to have on my site . I do recommend this . Something that I was looking for. This search extension is the best. Search Autocomplete and Suggest plugin is the best. Easy to install and object-oriented. Customers experience with it is so smooth! It served me a good job when I launched the site. Easy to install and configure. Works great. I needed the bracket to make a small adjustment and they were fast and efficient. I recommend the module and the company. This extension is excellent. I purchased same functionality extension from mageworx & installed on my website. But the search extension was not working completely. Then i removed mageworx ext & installed plumrocket search extension. Without any issue it's working excellent in my website . I didn't need any single support from developer. Thanks. It will add an extra value to my site and my customer will happy because the search is much more relevant and results are accurate. Works out of the box! Super great extension, allows our customer to search for products fast and easy.All the functions are as described. The best search module I have found. They have an extensive documentation.Thank you team. Hope to get a couple of other your extensions! Easy to install, great support. I was looking for a good auto search and suggest option and I have found what i wanted.So i think it will add an extra value to my site. My customer will enjoy it so much to search products. This is a best search extension I've ever found in Magento Connect. Easy install and the customer service of the Plumrocket is the best! A single problem: Search results appear only after about 2 seconds. I have about 20,000 products and an performant server. I do not know if the problem is with my site or something is normal. A great extension I would recommend it! One thing to clarify, our extension works with default Magento "Search Terms" functionality, it does include analytics that should do the job for all the necessary statistics on the search terms. We believe it should be satisfactory for most of our customers. The price of this extension is so attractive and unlikely you will find it else where with such price. Not only that, but it seems to be quick and lightweight extension. Highly advise to get it in all store sizes. Very easy to install and customize. We have gained more traffic after integration. Since we installed it, our conversion rate has increased vastly. And the search is much more relevant and results are accurate. Works out of the box! This application is essential for every store, works way better than the native laggy search in Magento. All the functions are as described. The best search module I have found. They have an extensive documentation. Very good extension. I recommend! Great module for my store. I contacted support with the couple of questions and they solved them quickly. Really love all the extensions I have from this company. Super great extension, allows our customer to search for products fast and east. I want to say that I was not disappointed with this search tool. Guys at Plumrocket did a very good job, and they have manuals on installation (I'm new to Magento) and else. Support was very good to my concerns. Thank you team. Hope to get a couple of other your extensions! Many search extensions for magento are out there and I was skeptic at first. But for the price mentioned, this particular extension has a very well developed algorithm. It worked on my instance for about a month now, and I wanted to thank the developers for a good job done. Call it a time-saver for your customers, surely worth trying.